Jack Wilshere’s man of the match performance against Brazil shouldn’t come as much of a surprise to Arsene Wenger or Arsenal fans. After all, they have seen him at close quarters excelling against the likes of Xavi and Iniesta at the Camp Nou. The Brazilian side at Wembley may not share much resemblance with Tele Santana’s team which captured the imagination of fans worldwide but for the English fans who’re so used to failure and under performance, Jack Wilshere is a breath of fresh air. And for once, England were not outplayed and out-passed on the pitch against a quality opposition. More than the result, Roy Hodgson would take more pleasure from the performance and the fact that his midfield came out on top. Add the outstanding but undervalued Michael Carrick to the mix and England have got strength in depth which few teams in the world can boast of. His passing is Xavi-esque and movement on and off the ball was exemplary. Add to that, the Arsenal youth product has that quintessential English aggression. Willing to put his body on the line, Jack doesn’t bat an eyelid when going in for 50-50 challenges. With Steven Gerrard moving away from his all-action style towards a more deeper and calmer role, Wilshere is exactly the player Roy Hodgson would like to have in his midfield. His pass to Theo Walcott just before Rooney’s goal against Brazil was weighted perfectly. Some of his one-twos with Rooney were a delight to watch. England’s only world-class player Wayne Rooney, according to Neymar, seemed to enjoy his association with Wilshere. For once, Rooney wasn’t the one who shouldered the playmaking responsibilities as he allowed Jack to take charge. Dropping deep, his link-up play with the Arsenal man was certainly encouraging. Also, Theo Walcott’s success in front of the goal this season fits in well in the scheme of things for England. With Rooney dropping deep, he can occupy the space vacated by the Manchester United forward. And his understanding with Wilshere will certainly profit England as it did in the first goal against Brazil where all the above mentioned parties were involved. Not the one to bow down to any sort of aggression on the field, Wilshere certainly encompasses what a typical English Box to Box midfielder is known for. Wilshere might not be a Bryan Robson, but he certainly gives it all on the pitch. His charging run backwards to stop Adriano with a crunching tackle is a testament to that fact. Of course, with these qualities come the added danger of losing your head and getting sent off, like England have found out in previous World Cups, with David Beckham in ’98 and Wayne Rooney in ’06. But as many a manager will tell you, everyone would love to have someone with that aggressive edge in their team. With England finally moving away from the 4-4-2, there is competition for the third spot in midfield alongside skipper Gerrard and Wilshere. Personally, I would like Michael Carrick and Steven Gerrard to play as a double pivot to allow Wilshere to play as number 10 and combine more effectively with Wayne Rooney. Also, with Carrick in the side, it allows Gerrard to make those late runs rather than always screening the defence and playing in a deeper position. The Liverpool legend may have become a bit slower but his shooting range is still the same. Probably against lesser sides, Hodgson could go in with Cleverley instead of Carrick so that there is a more of mobility between the lines. With Lampard, Osman, Barry, Henderson, Parker, etc. 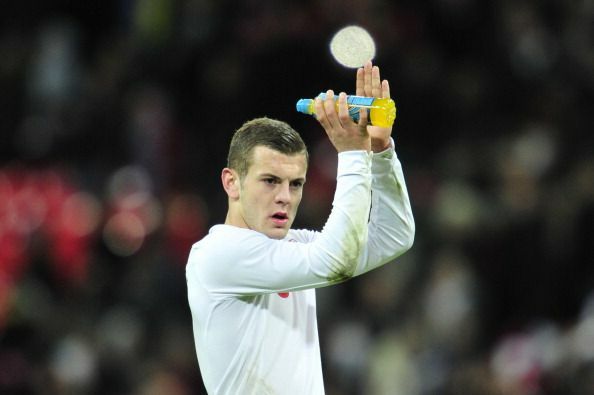 England do have strength in their squad depth but would struggle to replace Wilshere if he is injured. With him in the side, English prospects for 2014 certainly look bright. But as any England fan will tell you, never be too optimistic with the England Football team.